Carlton-in-Coverdale is a charming small village in the Yorkshire Dales National Park. Set in the heart of 'Herriot Country', Carlton is Coverdale's principal village. Comprising approximately 80 inhabitants, it has its own pub and is an ideal base for walking or touring in the beautiful National Park. 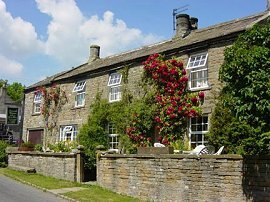 Abbots Thorn is approximately 200 years old and is a traditional, stone built former Dales farmhouse. It is one of the few that has round chimneystacks, the stones of which allegedly came from Middleham Castle. Formerly named Lilac House, the property has been lovingly converted into a warm and comfortable place to spend your holiday. From collectable cups and saucers to modern CDs Abbots Thorn is an eclectic mix of old and new. Pat's love of collecting is evident throughout the house and growing all the time! We have three comfortable guest bedrooms available, which are situated to the front of the house so you can enjoy the stunning views of Coverdale that unfold from our sunny, south facing location. These are furnished in traditional country pine with thermostatically controlled radiators throughout for your comfort. 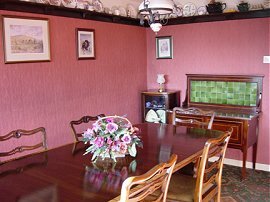 All rooms have a colour television and tea & coffee making facilities complete with biscuits and fresh milk. From sweets on your pillow to quality toiletries we try to make your stay one to remember. We even supply your bedtime reading. 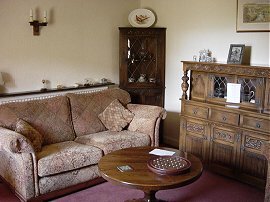 Lilac - a spacious double room with en-suite facilities and a sofa to relax on. The room is named after the tree from which the house was once named and it is still visible today from the window. 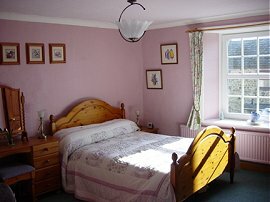 Honeysuckle - a comfortable twin bedded room, which can be converted into a large double bed, with en-suite facilities, a window seat and fragrant honeysuckle outside the window. 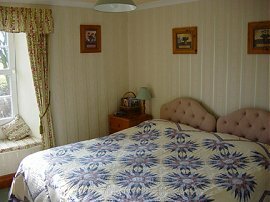 Jasmine - an attractive double room, which has sole use of the house bathroom. A sunny room with a window seat, to enjoy the view and the winter flowering Jasmine, which climbs the front of the house. After a good night's sleep, a full Yorkshire Aga cooked breakfast featuring traditional, local produce awaits you in our attractive dining room. For those with a lighter appetite we have a comprehensive menu where you can make your own selection - maybe you would prefer creamy porridge with whisky and cream or maybe American pancakes and maple syrup would be more to your taste? There may even be a breakfast special dish to choose - the choice is yours. Good food is always important, especially when you are on holiday, so why not sample our delectable dinners cooked on a traditional Aga. Available each evening (except Sunday), this is a set menu offering you good home cooked food, beautifully presented using fresh local produce whenever possible. Pat is an accomplished and enthusiastic cook and will happily cater for any special diets, food dislikes etc. and this will be taken into account when menu planning. We do not have a drinks license so please feel free to bring your own wine and we'll do the rest. After dinner, relax in our comfortable beamed guest lounge with coffee, mints and liqueurs, in front of our log-burning stove surrounded by a feeling of warm hospitality. A bountiful supply of books, games and jigsaws can be found, or why not just relax and indulge in conversation. We regret that we cannot accommodate children under 12 years of age. Abbots Thorn is totally non-smoking throughout. The following is a very small selection of places to visit close by. Middleham Castle, Richmond Castle, Richmond Theatre, Jervaulx Abbey and Bolton Castle. Aysgarth Falls, West Burton Falls, Constable Burton Gardens and Leyburn Shawl. Forbidden Corner, tea pottery, cat pottery, model village, cheese makers, teddy bear workshop, rope works and lots more! Aysgarth, Askrigg, Kettlewell, Hawes, Masham, Middleham, Muker, Leyburn, Reeth & Wensley. Situated in the Yorkshire Dales National Park. Guest lounge with oak beams and wood burner for those chilly evenings. Pet Facilities: Pets are allowed. Usually one well behaved dog but contact us if you have more than one! Special Diets Provision: Special diets are catered for. We can cater for most dietary requirements by prior arrangement. On reaching Leyburn follow the A684 towards Hawes. Go through Wensley over the River Ure and take the next turn to the left. Continue for 4 miles and at the "T" junction turn right. We are half way through the village on the right, please park on the left. Take the Masham/Thirsk turn off the A1. Turn left towards Masham and follow through to Middleham. Do not follow the main road to the right but continue straight ahead for 5 miles. When you reach Carlton we are half way through village on the right, please park on the left. For single person occupancy please contact us.